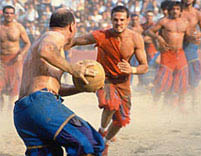 Calcio (Cal'-choh)Fiorentino or Storico was an early form of football that originated in 16th century Italy. The Piazza Santa Croce of Florence is the cradle of this sport, that became known as giuoco del calcio fiorentino ("Florentine kick game") or simply calcio (later being the name applied to soccer in Italian). The official rules of calcio were published for the first time in 1580 by Giovanni de' Bardi, a Florentine count. Just like Roman harpastum, it was played in teams of 27, using both feet and hands. Goals could be scored by throwing the ball over a designated spot on the perimeter of the field. The playing field is a giant sand pit with a narrow slit constituting the goal, running the width of each end. There is a main referee, six linesmen and a field master. Each game is played out for 50 minutes with the winner being the team with the most points or 'cacce'. Illustration of a game of Calcio Fiorentino from Harald er Stjerna 1688. Originally, calcio was reserved for rich aristocrats, who played every night between Epiphany and Lent. In the Vatican, even Popes, such as Clement VII, Leo XI and Urban VIII were known to play. The sport was not played for around two hundred years but then revived in the twentieth century when organized games began again in 1930. 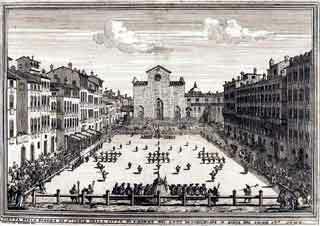 Today, three matches are played each year in Piazza Santa Croce, in the 3rd week of June. the four teams face each other in the first two games. The winners go to the final, which occurs on June 24, the day of the Saint Patron of Florence, San Giovanni ( St John ). The modern version allows tactics such as head-butting, punching, elbowing, and choking, but forbids sucker punching and kicks to the head. Quote from Ultimate Italy "Calcio Storico Fiorentino - Costume Foot Ball Game in Florence, Italy"
Written by Count Giovanni de' Bardi di Vernio in 1580 in his "Treatise on Football", the [game of] Calcio Storico has 54 players divided into two teams which are lined up in three rows. Though there are no major rules in this game, the final result has to end in a caccia or goal. Each end of the [field] has a four-foot wooden wall that runs its entire length. The round...ball is tossed over the wooden wall which denotes a caccia or a goal. In the center of each goal wall a narrow tent guards its goal while the captain of the team with the flag-bearer stand with their team's flag near the tent. The color of the balls and the tents vary according to the teams who are playing the match. Each year it varies and the finalists play the last match which decides the winner for that year. The game resembles Greco-Roman wrestling simulating the movements and motions with a mixture of rugby and soccer. With sand layering the entire square, the players run with the ball in their hands and pass it to their team mates. As they run, the opponents try to stop the [ball carrier] and pin them down till they are rescued by their own team players. This often results in their costumes being torn to bits and the players bloodied up but not too severely. There are six referees positioned at various points dressed in colorful Renaissance outfits of smooth velvet caps with ostrich feathers and doubleta of rich shades with knickerbockers. The referee judge, denoted by his sword, has a plumed hat that he sweeps with a flourish to acknowledge change of sides. The goal scored by the winning team spurs the standard bearer to run around the square waving the team's flag, whilst the losing team's standard bearer looks down-faced. The games begin with a long parade that winds through the center of Florence before arriving with fanfare and trumpets at the grand square before the Borgo Santa Croce. At the front are horsemen and foot soldiers in armor breastplates and helmets with plumes. Twenty drummers in yellow and blue silk tunics lead the teams in their colorful livery and feathered caps into the Piazza. A garland festooned heifer is lead in with much fanfare. This fattened calf is the prize that will go to the winning team. They are followed by the ranks of nobility and wealthy merchants in Renaissance attire, attended by their flag-bearers and costumed courtiers. Wild in the Streets Trailer a movie about Shrovetide Football in Ashbury, England. If you want to add this article to your list of favorites or email it to a friend, please use this permanent URL, https://stores.renstore.com/-strse-template/1207A/Page.bok. Permission is granted by the author to quote from this page or use it in handouts as long as you include a link back to Renstore.com.